The Managing Director of Palli Karma Sahayak Foundation (PKSF), Mr. Md. Abdul Karim, paid a visit to various programmes that are being implemented by two of the Partner Organizations operating in Chittagong namely ‘Integrated Development Foundation (IDF)’ and ‘Mamata’ during 04-08th April 2016. The Deputy Managing Director of PKSF, Mr. Golam Touhid associated him on his visit. Mr. Karim went to see health-camp, eye-camp and development fair which are being arranged by ‘IDF’ under the ENRICH programme of PKSF in Satkania union of Satkania upazilla. Again, he visited treatment-camp arranged by ‘Mamata’ in Charkanai village of Habilasadip, Patia Union. 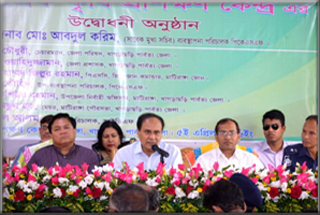 During the visit, Mr. Karim inaugurated an agricultural training center of ‘IDF’ in Matiranga, Khagrachari and placed the foundation stone of a dairy farm of ‘Mamata’ in Charkanai village of Patia upazilla. 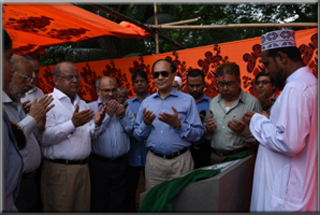 Moreover, Mr. Karim inaugurated an extended unit of a maternity center in Bandartila under Chittagong City Corporation. Mr. Karim was made chief guests in meetings held in all of the above occasions. Among many local representatives and noted person the Chairman of Khagrachari Hill Tracts District Committee, District Commissioner, Police Super, and Civil Surgeons from Chittagong, Executive Officers of respective upazilla were present in those meetings. During the said visit, the Managing Director of PKSF went to see the poor people dwelling in Sajek union of Rangamati in order to reach them through PKSF’s services. On that matter, Mr. Karim had a meeting with the Regional Army Commander- the Commanding Officer of 4th East Bengal Regiment.